Steps have been built, aluminum handrails added, decks constructed, spare tires relocated, and laser beams pointed. Check out the Mega Mods, pick your favorite, and vote. Welcome to the February 2016 Monthly Mod Contest. Please review the following six Mega Mods and vote for your favorite. We will announce the February 2016 Mod Contest winner next week. For more information about the Monthly Mod Contest, including how to enter, click here. Click here to see the winner of this Mega Mod contest. 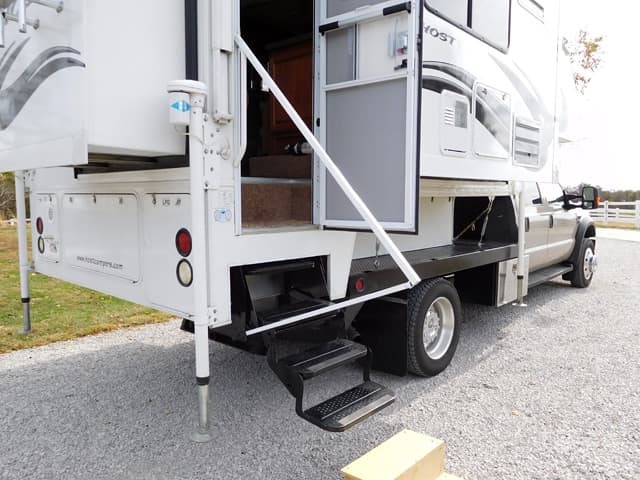 When our camper was mounted onto our 2014 Ram 2500 four-wheel drive truck, it was difficult getting in and out of our camper. We had a 5-inch wide by 5-inch high bumper-step, and the single 5-inch wide by 8-inch drop down step that came with it. 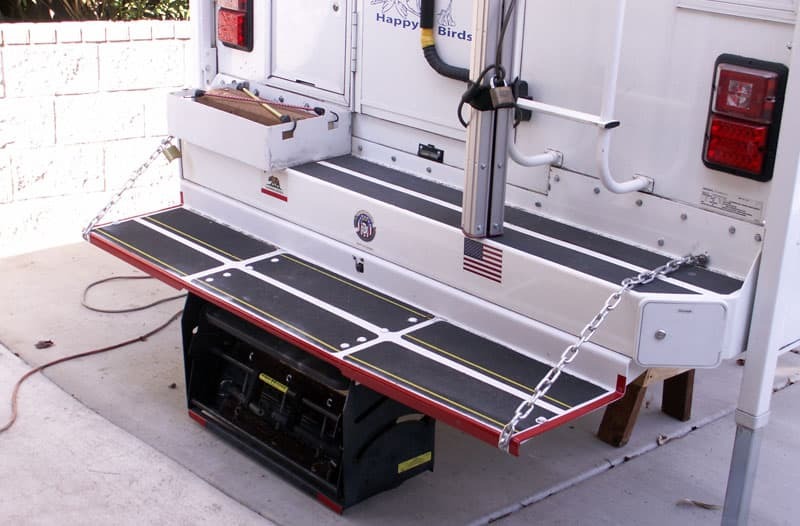 I designed and installed a 3/16-inch plate-aluminum landing-step and added a RV retractable 3-step system to that. My landing step wraps under and behind the camper bumper. I secured it to the camper’s frame with bolts, nuts, and lag bolts. 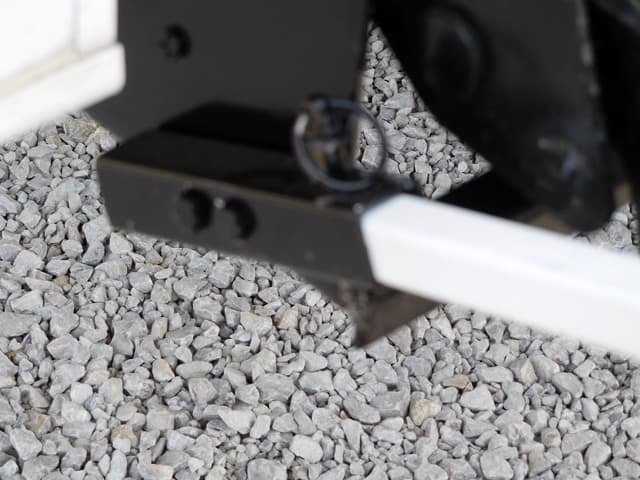 The steps drop down an additional 3-inches from the 5-inch bumper step, making for an 8-inch step. 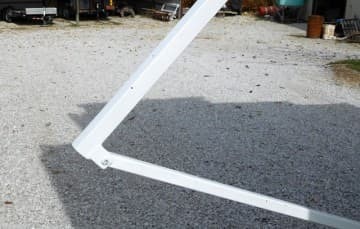 It extends out 16-inches to make for a nice landing that seconds as a bench seat, and extends the width of the bumper-step. 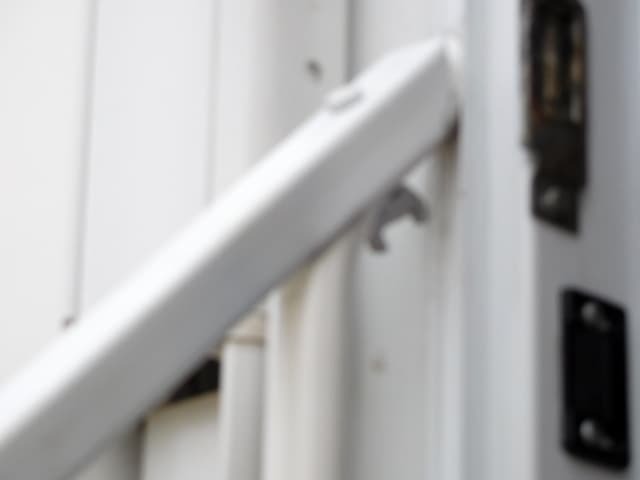 I also added one ¾-inch chain on each end to the landing, the bumper-step, and the camper’s wall. It’s an additional secure attachment so it doesn’t tend to bend down when stepped on. 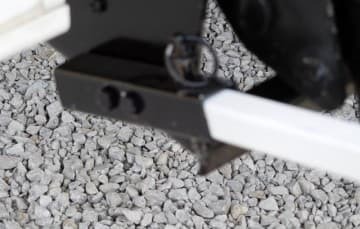 It provides the needed landing to stand on while opening the camper’s door (especially when it’s up in the air on a four-wheel drive truck) and getting in and out of the camper. Then I added a collapsible, fold-down RV three step and added adjustable legs to level it on any ground. 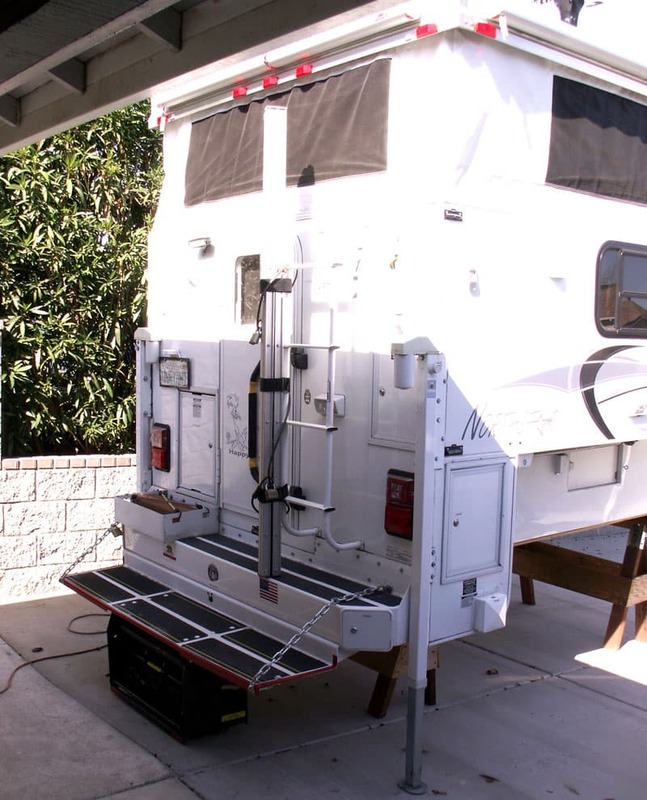 We have only made one two week trip with our camper since installing the new landing step. It worked great! It is so much easier getting in and out now. It took me five hours to complete. It took a couple hours to design to spec, an hour welding, and a couple installation hours to complete. It cost $300. In my opinion, the skill level of this mod is hard because the materials need to be cut and shaped to spec with braces heliarc welded on each end. I had a little difficulty going up and down the steps of my camper. 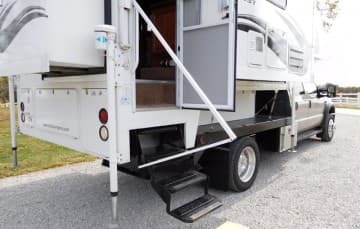 Having a tall camper and a tall truck bed – my flatbed is 31-inches off the ground – I was kinda looking down from the door. I was thinking that there should be a hand rail. After a few different ideas, I came up with this configuration. I first started with a piece of 1-inch square tubing, and cut out enough of one side to allow me to put the tubing over the existing handle. Then I drilled a ¼-inch hole through both pieces. 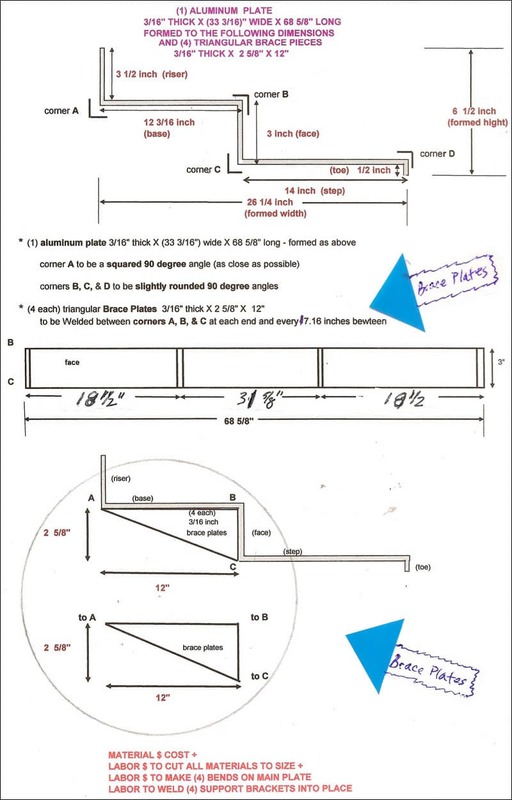 I measured the distance I needed to the bottom and cut it off. 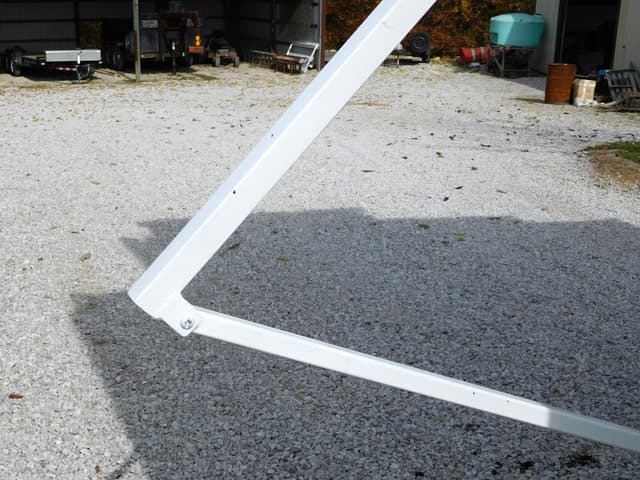 I used a piece of ¾-inch square tubing to make the bottom support and a short piece of the 1-inch square tubing to make the lower support piece, and bolted it to the outside of the step frame. I welded a small tab of steel for a hinge for the lower support. I used a ¼-inch bolt with a wing nut for the top, and a ¼-inch pull pin for the lower attachment point. The pictures show what it looks like after a paint job. 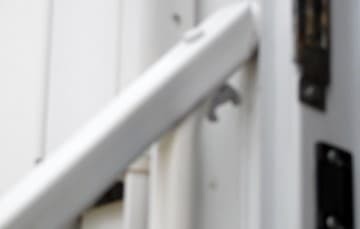 The railing has given us security when going up or down the camper steps.